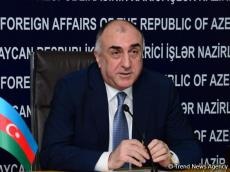 Azerbaijan is ready to continue substantive negotiations aimed at beginning the process of phased settlement of the Armenia-Azerbaijan Nagorno-Karabakh conflict, Azerbaijani Foreign Minister Elmar Mammadyarov said in an interview with RIA Novosti. “Moreover, if you follow the recent negotiations, you will notice that namely Baku has repeatedly voiced the position on the need to promote a responsible dialogue aimed at ending the occupation of Azerbaijani territories, creation of conditions for the safe and decent return of IDPs, including representatives of the Azerbaijani community of Nagorno-Karabakh, to their homes, followed by ensuring broad rights of self-government for the population of the Nagorno-Karabakh region of Azerbaijan, consisting of its Armenian and Azerbaijani communities,” said Mammadyarov. The foreign minister noted that the conversation at the highest level held between President of Azerbaijan Ilham Aliyev and Prime Minister of Armenia Nikol Pashinyan on the sidelines of the last CIS summit in Dushanbe is a good example of Azerbaijan’s readiness for meaningful dialogue. Further, Mammadyarov noted that Azerbaijan pursues a balanced foreign policy. “In this regard, we are developing an active bilateral dialogue and mutually beneficial equal cooperation with all the member states of the Collective Security Treaty Organization, of course, with the exception of Armenia, which continues to carry out military aggression against Azerbaijan by occupying the internationally recognized territories of my country, where it conducted bloody and total ethnic cleansing against Azerbaijani population,” said Mammadyarov.